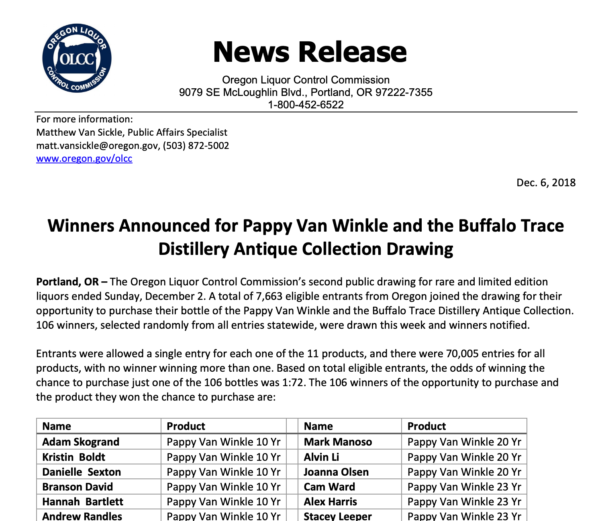 … Last year, the OLCC created a drawing that gives the public a chance to buy rare bottles, like the elusive Pappy Van Winkle and the Buffalo Trace Distillery Antique Collection. A total of 7,663 people entered the December drawing for the opportunity to purchase one of the 106 rare bottles. “We really leveled the playing field so anybody from Portland to Enterprise to Philomath can have a chance to purchase a bottle that they otherwise may not have a chance to,” explained Matthew Van Sickle, spokesman for the OLCC. Van Sickle admits only a fraction – roughly 4 percent of the state’s rare bottles – go into the drawing, although the OLCC is looking to continue and possibly expand the drawing system. As a hobbyist collector, Lehr, would like to see either a first-come, first-serve policy for everyone. Or, Lehr argues, the OLCC should put all limited-edition bottles into a drawing so everyone has equal odds. “It’s really frustrating that there’s this inequality in the market,” said Lehr. can we auction off CAS in a similar manner?